What I want to discuss here is constructing a machine that could imitate the qualitative experience of human life. British mathematician Alan Turing proposed a simple test. What if we could create a machine that could engage in human-like conversation such that in a blind test, people were fooled into thinking they are speaking with an intelligent human. Today, some computer programs are capable of fooling a minority of testers. But we are actually nowhere near creating machines with human-like experiences. Simply acting as if intelligent is not proof of intelligence. Does a computer understand what it is doing? To help us consider this, American philosopher John Searle proposed a thought experiment. Consider a closed room with man inside who can only communicate by receiving or outputting little papers. He receives squiggles that he does not understand but he can look them up in a manual and find corresponding output messages for each squiggle he receives. Suppose he outputs messages speedily and consistently. Now, suppose that these squiggles were actually writing in a foreign language and that outside the closed room, speakers of that language feel like they are actually having a conversation. What is key to this example is that a sufficiently complex manual could help the man in the closed room fool others into thinking he understands them: but he has no knowledge of what he is actually communicating about. So we can now see that a key element of intelligence is understanding the meaningfulness of the ideas being used. A calculator does not have a “concept” of the number one. Even a very elaborate program that mimics conversation and insists, “I'm alive!” is only doing so as a result of its programming … as a puppet's movement is the result of the human holding the strings. Turing did not intend his test to show that fooling people is intelligent: Turing supposed that to beat the test, a machine would have to learn, to make intuitive connections that were not pre-programmed, to make judgements about the content of the conversation. Such a machine would be intelligent … but human society seems a long way away from machines with such capabilities. But what if we could make a machine that could consider the meaningfulness of experience? Is it possible? And would it be right? There are interesting Catholic perspectives on these questions. Pope Francis has wisely criticized an entirely materialistic view of the world: we must ask not only what is but what ought to be. We must serve the reality of the dignity of the human person. Thomas Aquinas in his Summa Contra Gentiles considers humans to be creators. We fulfil our role in God's creation by caring for the land and for one another – and we also generate new ideas and perspectives, exploring the infinite possibilities of God's creation with our intellects. We should use our intellects to do good and not evil: we are as capable of designing delicate, decision-making machines to guide bombs as we are of making them to guide life-saving surgeries. Often, when faced with new technology, people are reticent by default. 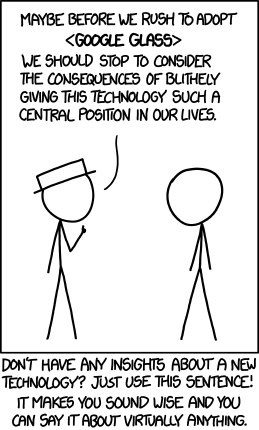 Consider this comic by Randall Munroe. To immediately reject novelty is an immature response. In the safety of our imaginations, we can be a lot more open to possibilities. 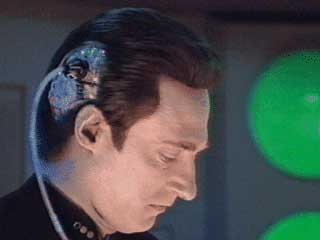 I was a big fan of Star Trek: The Next Generation and its lovable artificially intelligent crew member, Mr. Data. Data seems to be much more than a clever mimic. He can learn. He often resembles a child trying to figure things out. One of the great virtues of the crew is their continued efforts to help Data wrestle with the problem of what we do with the gift of life we're given. If we ever created an intelligence like Data, it would behove us to treat it with ethical respect; and to help it such that it discovered respect for the lives of others. We could receive from it, as we do from the fictional Mr. Data, the great gift of a different perspective about life and its experiences. I think our ability to find meaning in our experiences is sacred. 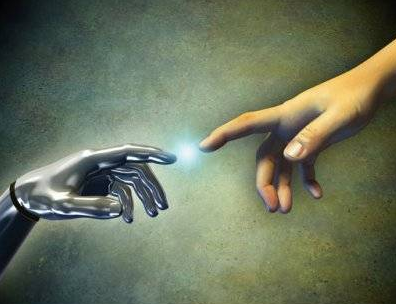 A machine that could also find meaning in life would have a sacredness and a relationship with God similar to our own.